The problems attributed to the likes of Facebook, Google, Amazon, and Twitter – from Russian interference in Western elections to market concentration and tax avoidance – have become almost too numerous to list. And now the search for solutions is on. In the wake of recent high-tech mishaps, do we really need to establish new regulatory principles and agencies to manage emerging risks? While the European Union certainly seems to think so, following its lead could be a costly mistake. WASHINGTON, DC – In the wake of recent high-profile tech scares, such as a fatality involving an Uber self-driving car and Facebook’s alleged mishandling of users’ personal data, stricter regulation of the industry – along the lines of, say, the financial sector – has become the policy question du jour. Stock-market values for leading tech companies are down – or perhaps just becoming more volatile – in the light of such concerns. Obviously, rules regarding motor vehicles need to be examined carefully. In the United States, this is generally a state-level decision, though the federal National Transportation Safety Board has a very good reputation for its investigations and often changes how we think about best practices. The NTSB is investigating the Uber crash and previously assessed a fatality involving a Tesla vehicle. As for Facebook, press reports suggest that the company may have made some egregious mistakes. One hopes we will learn more about the details of its decision-making on data privacy when its chairman and CEO, Mark Zuckerberg, testifies before Congress, as he has agreed to do. But responding with tighter regulation at the federal level seems premature, even for these specific activities – let alone for the broader tech sector. Finance is regulated because of major potential spillover effects: bank failures can bring down the whole economy. That is why safety nets, such as deposit insurance, have been put in place. But the existence of deposit insurance creates room for abuse, in the form of excessive risk taking, because bank executives get the upside if things goes well, and any potential losses are imposed on the insurance fund. Preventing abuse and encouraging appropriate caution requires rules, and the US Federal Deposit Insurance Corporation is one of the world’s best examples of how to make these work. The world of high technology – computer hardware, software, and digital services – is very different. There is plenty of competition for hardware. If one firm gets into trouble, it will not bring down the system. Of course, some policymakers like to favor “national champions” vis-à-vis international competitors; but this raises issues that are different from regulating behavior. Amazon is a powerful and rising company, spanning multiple activities – now including grocery stores and the delivery of fresh food. But it has plenty of competitors in this area, and existing rules and regulations (such as those covering how food is handled) seem sufficient. Other digital-based companies, such as Google and Apple, are very strong in specific activities. But they do not exhibit the kind of monopoly pricing behavior that triggers anti-trust action by the government. And it is not clear what other kind of regulation would be helpful to customers. The European Union is considering more regulation of digital firms, and insisting on greater care for the handling of data may make sense. But the EU also substantially missed out on the round of digital entrepreneurship that began in the 1990s, and it is not generally at the forefront of this sector currently – so few people in the US are rushing to follow its example. To avoid misunderstanding, let me be clear: not everything is going well with regard to US government policy in this area. In particular, the impending repeal of the “net neutrality” rule by the Federal Communications Commission (FCC) appears to be a major step toward favoring large incumbents and away from making it easy for digital start-ups to prosper quickly. Andy Lippman of the MIT Media Lab has a very good video explainer on this issue, which should be required viewing for policymakers (and voters). Cryptocurrencies reflect a growing overlap between finance and tech. It would not be a surprise if the US Securities and Exchange Commission determined that a great deal of recent money-raising activity (known as Initial Coin Offerings) in this industry actually amounts to the issuance of securities, which would trigger the application of various rules and requirements. But such a decision would not amount to new regulation – just the application of existing regulations. The principles applied by securities regulators since the 1930s remain sensible: protect investors and require sufficient disclosure of all the risks involved in an investment. The same is true of self-driving cars. There were 40,000 road fatalities in 2016 in the US, and more than one million worldwide, according to the latest World Health Organization data. As in all previous years, human error of various kinds was responsible for most of these deaths. Reducing road fatalities is an important goal, and the growing engagement of tech companies (and competition with the established auto companies) should be welcomed, in the interest of improving road safety. Here, too, existing regulatory principles, and the agencies that apply and enforce them, should be given an opportunity to prove themselves. In an ideal world, major tech companies would recognize and adjust to their growing systemic importance in step with external actors, including governments and consumers, thereby striking the right balance between innovation, consumer benefits and protection, and national security. But this is not an ideal world. The longer this process takes, the greater the risk that tech firms will lose control of the narrative. Beyond fueling a rise in outside monitoring, regulation, and supervision, there is the risk of a consumer backlash – or even the further exploitation of innovations by malicious actors. Big Tech can and should play a larger role in helping the entire economy to evolve in an orderly and mutually beneficial manner. This will require, first and foremost, that they internalize their own systemic importance, and adjust their perspectives and behaviors accordingly. But it will also demand far better communication, with firms’ objectives and operations becoming much more transparent. And, finally, it will call for a commitment to enhanced monitoring both of themselves and of their peers, together with more effective collective action, as appropriate. STANFORD – For more than 30 years in advanced economies, particularly the United States, wealth and income inequality have increased, real (inflation-adjusted) wages have risen slowly, and retirees have faced declining interest rates on savings. This has occurred while corporate profits and stock prices have risen sharply. Now, research I have conducted shows that these changes were primarily caused by the rise in modern information technology (IT). IT has impacted the economy in myriad ways; the computer, the Internet, and mobile technology have transformed media, online retailing, the pharmaceutical industry, and countless other consumer-related services. IT has improved life enormously. For starters, the very structure of the IT sector allows for the formation of monopoly power. IT has improved the processing, storage, and transmission of data, and IT innovators are the sole owners of major information channels that they actively work to prevent competitors from using. IT firms could defend their monopoly power through patents or by copyrighting intellectual property. But these routes require making trade secrets public. So, for strategic reasons, many firms forego legal protections, and consolidate a dominant market position by issuing ongoing software updates that, by default, serve as barriers that are difficult for competitors to breach. When potential new technologies emerge, bigger firms often acquire their challengers, either to develop the competing technologies on their own, or to suppress them. Once an innovative firm establishes platform dominance, size becomes an advantage. Because the cost of processing and storing information has declined in recent years, a firm with a size advantage has smaller operating costs, and profits rise rapidly as the number of users multiplies (Google and Facebook are good examples). These cost and economies-of-scale advantages are almost impossible for competitors to overcome. In addition, because these firms derive their power from information, their positions are enhanced by their ability to use their customers’ private information as a strategic asset. Indeed, many IT platforms are not producers in the traditional sense; they are public utilities that enable coordination and information-sharing among users in diverse fields. In short, IT enables the creation of barriers to market entry, and then encourages leading firms to become further entrenched. With the pace of IT innovation increasing, monopoly power is also rising. In a recent paper measuring the economic effects of monopoly power, I approximated normal levels above which profits or stock values are not purely chance events, but rather reflective of monopoly power. With these levels, I measured the monopoly component of total stock values – what I call “monopoly wealth” – and of monopoly profits or rent. I then sought to determine how monopoly wealth and rent have evolved. 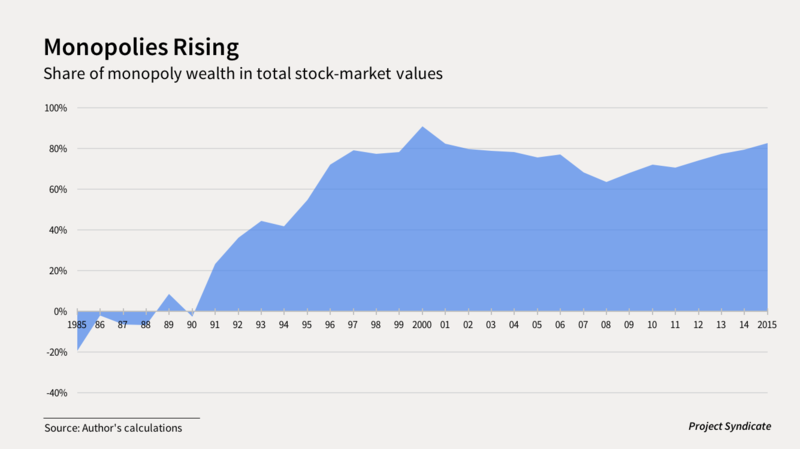 The figure below shows monopoly wealth as a percentage of total stock-market value between 1985 and 2015. 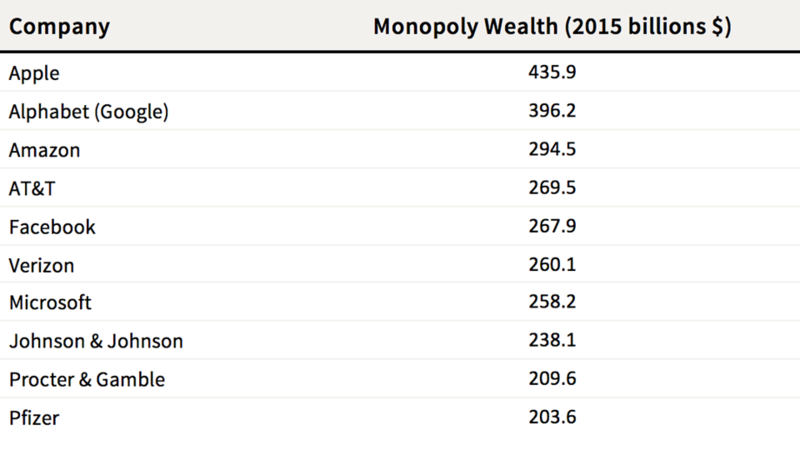 As the data show, there was no monopoly wealth in the 1980s. But as the IT industry developed, monopoly wealth rose dramatically; it reached 82% of total stock-market value – equivalent to some $23.8 trillion – in December 2015. This is the extra wealth gained by rising monopoly power, and it is continuing to grow. To put in perspective the percentage of monopoly wealth, consider the related sharp rise in corporate leverage. In 1960, the percentage of all real corporate assets financed by debt was less than 20%. By 2015, that share had risen to about 80%, meaning that most capital held by public corporations today is owned and traded by bondholders. In other words, investors have agreed to finance corporate debt by using monopoly wealth as collateral, and most trading in the stock market can therefore be thought of as traded ownership of monopoly wealth. As the table below shows, nine of the ten firms with the largest monopoly wealth in December 2015 are IT-related, focusing on mobile communications, social media, online retailing, and drugs. Similarly, most monopoly wealth among the top 100 firms, is being created by companies transformed by IT. Income created by firms with monopoly power is divided into three types: labor income, normal interest income paid to capital, and monopoly profits. The data show that in the 1970s and early 1980s, monopoly profits were negligible. But since 1984, the share of monopoly profits has risen steadily; it reached 23% of total income produced by American corporations in 2015. This means that during the three decades before 2015, monopoly power caused the combined shares of wages and normal interest on capital to decline by 23%. Rising productivity and capital accumulation increases wages and capital income, but monopoly power reduces these income shares. This partly explains why, during the 1985-2015 period, wages exhibited sluggish growth and retirees faced declining interest rates on their savings. Why, then, has rising monopoly power in the IT sector caused income and wealth to concentrate in fewer hands, leading to an increase in personal income and wealth inequality? One part of the answer is that rising monopoly power increased corporate profits and sharply boosted stock prices, which produced gains that were enjoyed by a small population of stockholders and corporate management. But, given that many IT entrepreneurs were young at the start of their careers, with limited ownership of stocks, a more refined explanation is needed. This was not true in the twentieth century, when major innovations in leading sectors such as automobiles required large investments of risk capital. With more investors needed, the wealth created was distributed more broadly. The negative side effects of IT are not well understood, and public discussion of how to regulate the sector is urgently needed. Three considerations are critical. First, because most technology-based monopoly power does not violate existing antitrust laws, regulating IT will require new measures to weaken monopolies. New concepts of the public interest are also needed for regulating new public information channels such as social networks. Second, standard views of business income and wealth taxation will need to be adapted to account for IT firms’ monopoly power. And, third, laws intended to protect private information should be reevaluated to ensure that IT companies are unable to profit from exploiting and manipulating it. Above all, the public must develop a deeper understanding of the economic effects of IT, particularly how technologies that have improved the lives of so many are enriching the lives of so few.